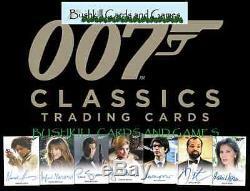 JAMES BOND CLASSICS TRADING CARDS FACTORY SEALED CASE. One factory sealed case containing 12 sealed boxes. Each box contains 2 random authentic, hand-signed autograph cards, one complete base set, and several great inserts! Also look for randomly inserted relic/prop cards! There is also an exclusive case topper card packed within this case! Daniela Bianchi Tatiana Romanova/From Russia With Love. Jeffrey Wright (Felix Leiter/Casino Royale). Pierce Brosnan (James Bond/The World Is Not Enough). Roger Moore (James Bond/The Man With The Golden Gun). Samantha Bond (Moneypenny/The World Is Not Enough). Sophie Marceau (Elektra King/The World Is Not Enough). Mathieu Amalric (Dominic Greene/Quantum of Solace). David Harbour (Greg Beam/Quantum of Solace). Diane Lee-Hsu (Loti/Licence To Kill). Pavel Douglas (French Warship Captain/GoldenEye). Cary-Hiroyuki Tagawa (Kwang/Licence To Kill). 72-Card Base Set: The World Is Not Enough (starring Pierce Brosnan), with more than 130 different photos, retelling the entire story of this classic 007 film, scene-by-scene. Each Throwback set also features full plot synopses, retold scene-by-scene. More than 100 different photos per movie/set! On Her Majesty's Secret Service (starring George Lazenby). The Man With The Golden Gun (starring Roger Moore). Licence To Kill (starring Timothy Dalton). Plus GOLD Parallel Sets for The World Is Not Enough and Licence To Kill, plus other randomly inserted BONUS CARDS! NOTE: The image shows multiple cases. You will receive ONE case per ONE quantity ordered. We have been in this business for over 15 years! We pride ourselves in our professionalism and attention to customer service. This means that you get first class service and the lowest possible pricing for products made by these manufacturers! We sell only top quality, top condition products - all singles and sets we sell are in mint/near mint condition unless otherwise noted. With every sale we make, we remember that YOU keep US in business! Small sets will generally be in one team bag sandwhiched between two top loaders. Larger sets will not have any top loaders and be divided up into seperate team bags. The cards inside will be safe, but the boxes themselves will not arrive in perfect condition. Your order will be packed inside of a sturdy box with plenty of peanuts around it to protect the item(s). Please be aware of your country's import laws prior to purchasing from us. 9 Item Condition : In general, all items we sell are in mint/near mint condition and any exception to that will be clearly noted in the listing description. By "mint" or "near mint" condition we are referring to the condition of the actual card i. Free of dents, dings, scratches, or other defects caused by mishandling. We are NOT referring to printer defects such as offset images, hand-signed autographs that run off the edge of the card, poor quality signatures, or any other similar issue that occured at the factory/printer. PLEASE NOTE THAT UNLESS OTHERWISE NOTED, ANY IMAGES SHOWN ARE STOCK PHOTOS REPRESENTATIVE OF THE CARD/ITEM FOR SALE AND NOT AN IMAGE OF THE ACTUAL CARD YOU WILL RECIEVE. The common exception to that is PRE-SALE items, which will be clearly noted in the description above. ABOUT BUSHKILL CARDS AND GAMES. Bushkill Cards and Games has been operating since 1997, first under the name Picard's Grand Auctions and then our new name in 2004 when we moved to the Bushkill Township-Nazareth area. We have also begun stocking Magic The Gathering by Wizards of the Coast and Topps sports and entertainment products. We price the products we sell as competitively as possible. Without your satisfaction and repeat business, we would not still be in business! The item "2016 James Bond Classics Factory Sealed 12 Box Hobby CASE 007" is in sale since Friday, March 11, 2016. 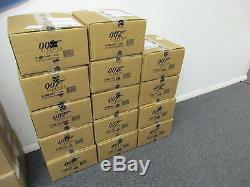 This item is in the category "Collectibles\Non-Sport Trading Cards\James Bond Trading Cards\Sealed Trading Cards". The seller is "bushkill_cards_and_games" and is located in Wind Gap, Pennsylvania. This item can be shipped worldwide.